The Nintendo 3DS launch in Japan is exactly one month away for those in North America. But for an initial release, the gaming platform is already a sold out. 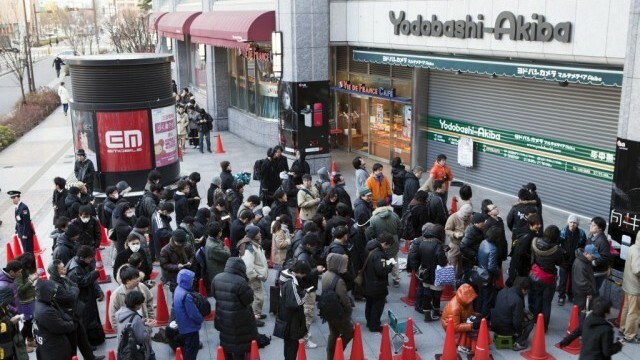 The Nintendo 3DS which made its launch in Japan last Saturday is definitely a sold out. However, most of them were pre-orders only. Still, there are some stores in Japan with the same-day units that drew the line up to 1,000. The stocks ran out fast by 9:00 in the morning, so most people were out of luck. Good thing, Nintendo officially announced that it will ship 1.5 million units to Japanese shops by March 31. Retailers all over Tokyo added demo kiosks to build up to the system’s launch. These kiosks allowed gamers to sample the Nintendo 3DS game titles. For the unfortunate ones who did not get a Nintendo 3DS of their own, other shops list new shipment time frame as TBA. Do you have your own Nintendo 3DS now? How’s your initial impression? Happy Pre-Order a Nintendo 3DS Day!